The National Marine Park of North Sporades is a great attraction for visitors to Skopelos. The park was the first designated Marine Park in the country and is currently the largest marine protected area in Europe. Besides the open ocean, the park includes Alonnisos, six smaller islands (Peristera, Kyra Panagia, Gioura, Psathura, Piperi and Skantzoura), and 22 uninhabited islets and rocky outcrops. 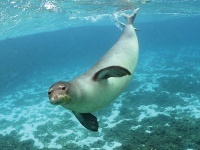 The waters are a conservation area as they are the breeding grounds for endangered Mediterranean monk seals. There are also a number of dolphin and whale species in the area, including the striped dolphin and the long-finned pilot whale. The park is very beautiful and there is lots to explore. One of the most popular and beautiful beaches is Agios Dimitrios, a pebble beach with stunning turquoise water, which has been voted several times as one of the most lovely beaches in the world. There are many wonderful beaches to explore in the park and several great walking paths. On Alonnisos you will find Patitiri port, from where many boats depart to all the beaches of the island as well as the rest of the islands of the Marine Park, where access is permitted. Some areas are kept completely free from human influence.